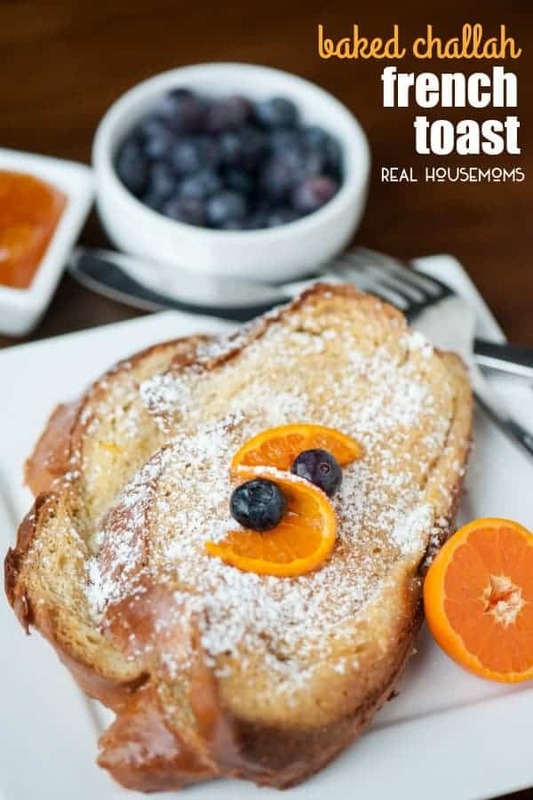 Challah is the perfect bread for french toast, and this heavenly BAKED CHALLAH FRENCH TOAST can be made ahead the night before for an easy family breakfast! I am a lover of french toast. It satisfies my craving for carbs but its also filling because of the eggs. But let’s face it, transforming an entire loaf of bread into french toast by cooking it one slice at a time is quite tedious. And on mornings when I just want to relax and sip my coffee and have someone serve me breakfast in bed, standing at the stove and serving up a few pieces of french toast at a time to hungry children is not my idea of fun. Easy casserole recipes to the rescue! That, my friends, is why I love overnight french toast. First, you assemble everything the night before so all you have to do in the morning is pop it in the oven. I also love making french toast this way because it gives that soft bread 10-12 hours to completely soak up that wonderful egg, cream, vanilla and zest. 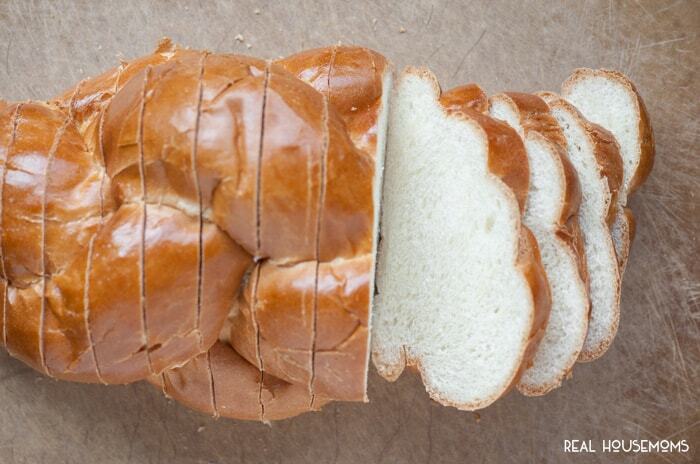 Let the bread become one with the liquid – you won’t regret it. I chose Challah for this french toast feast because its a wonderfully soft bread that’s already made with egg. Its one of my favorites to use for french toast. I promise you won’t regret it. See how easy this looks? 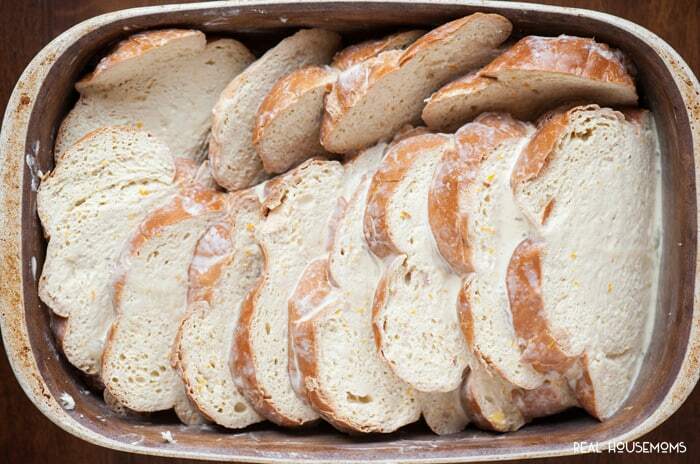 All you do is slice up the bread, dunk each piece in the mixture, layer them best you can into a casserole dish, and pour any extra liquid on top so that none of it gets wasted. The result is a perfectly cooked, perfectly moist, perfectly easy breakfast that can be served to the entire family at the same time with minimal effort on your part. 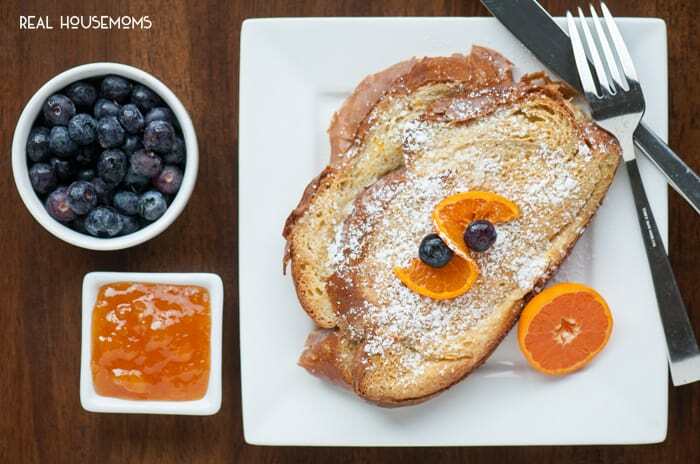 Challah is the perfect bread for french toast, and this heavenly Baked Challah French Toast can be made ahead the night before for an easy family breakfast. The night before, use a large bowl to whisk together eggs, heavy cream, milk, orange juice, zest, nutmeg, cinnamon, and vanilla until eggs are beaten and mixture is well combined. 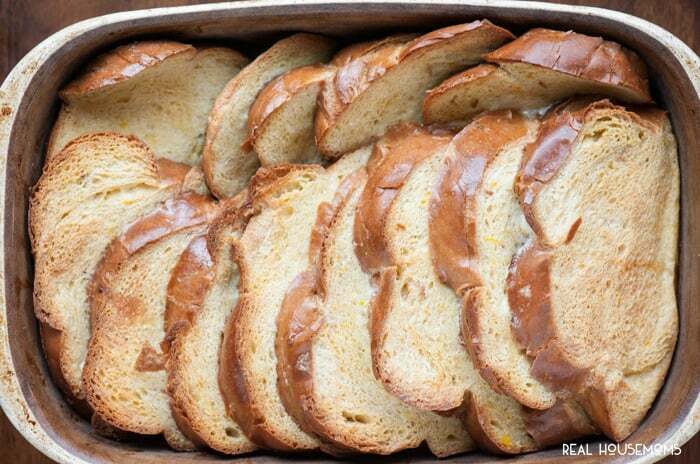 Dip Challah slices in egg mixture and layer in a buttered 9x13 inch casserole dish. Pour remaining mixture over the top and press down. Cover and refrigerate overnight. 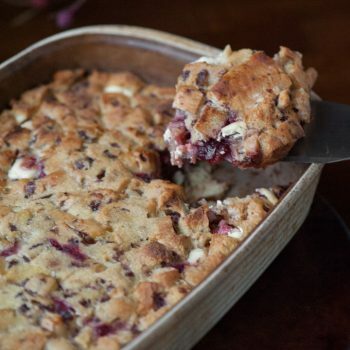 When ready to bake, preheat oven to 350 degrees F. Uncover the casserole and dot with butter. Bake in preheated oven for 35 minutes or until top is golden brown. If top browns to quickly before french toast is set, you may cover loosely with aluminum foil for remainder of cooking time. 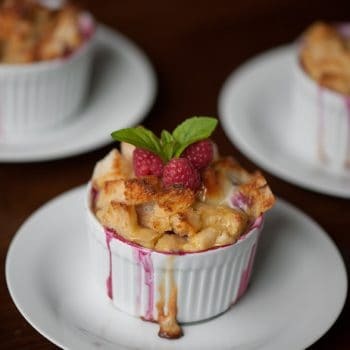 Serve with marmalade, mascarpone, syrup, fresh fruit, whipped cream, or any combination you'd like!